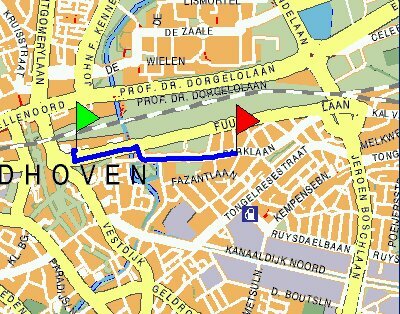 The venue's address: Parklaan 93, 5613 BC Eindhoven. Should you be arriving by train, please exit the railway station towards the city center and turn left (Stationsweg). You will be walking away from the center. 400 meters further turn right to Parklaan. 600 meters further you should see the Academisch Genootschap on your right. All images on this page are borrowed from http://www.academischgenootschap.nl/?id=79.The green flag denotes the railway station, the red one - Academisch Genootschap. Should you be arriving by car you might like to use the private parking of Academisch Genootschap (behind the building). The parking is accessible from Fazantlaan. Departing from the Academisch Genootschap building you should drive eastwards (away from the city center) and turn right twice. 100 meters further on the right side you shall see the parking entrance. Academisch Genootschap is located south of the railway station. 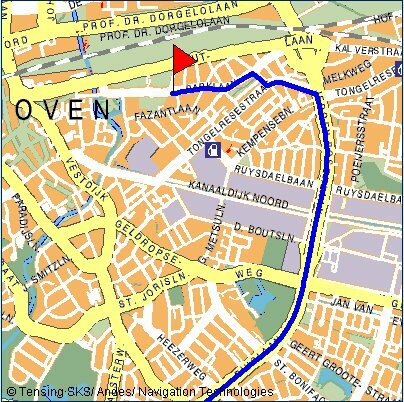 The following maps illustrate the major higways in the area of Eindhoven and three main access directions: from the North, from the South and from the West. Important: the last image shows the access route into Eindhoven, coming from the West (Tilburg, Breda). However this road is temporarily closed! Alternative routes are advised (see below), but please take into account possible delays in getting to the city centre of Eindhoven during the morning rush. - For traffic coming from A50, Nijmegen: at junction Ekkersrijt, via John F. Kennedylaan direction Eindhoven city centre. - For traffic coming from A2, Den Bosch: on A2 take exit 28 Best, via Eindhovensweg Zuid and Boschdijk direction Eindhoven city centre. 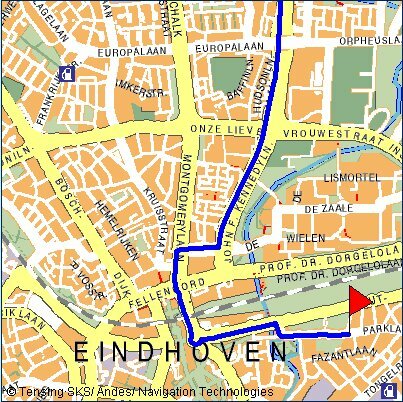 - For traffic coming from A58, Tilburg: at junction Batadorp, follow direction Son/Helmond, at junction Ekkersrijt via John F. Kennedylaan direction Eindhoven city centre.